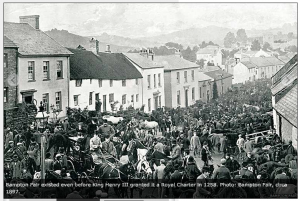 The Ginger Peanut is located in the centre of Bampton, Devon and we thought it would be interesting to have a brief look back in time at the history of this small town in beautiful Devon. There are indications that there has been a settlement here since the stone-age, being a sheltered valley with a small tributary running through it thus providing an ideal location then as indeed it does now. There was a Saxon settlement here the remains of which may be seen on the edge of town. All that now remains is the defensive mound and traces of an ancient church and cemetery are to be found in the area on the site of the present church. The Norman invasion in 1066 then saw a spate of building and the fortification of the old Saxon castle. Indeed Bampton is listed in the Domesday book and referred to as the Hundred of Baentona. The castle was last recorded as being occupied in 1536 and in 1607 was destroyed by an earthquake! The Civil War took its toll on the town when much of it was burned to the ground and, today, little remains that predates 1645 apart from a few historic buildings and part of St Michaels and All Angels Church which dates from the early 12th century. The town found wealth in the 18th century due to the wool trade and merchants built the stone houses that we see today. 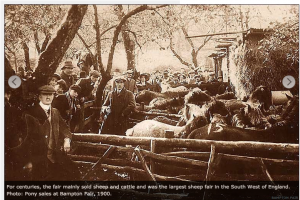 Bampton Fair was granted a royal charter in the 13th century and an indication of the importance of the wool trade in the town is illustrated by the fact that the early 1800s saw 14,000 sheep sold annually at the fair. As the wool trade became less important, the sheep sales were replaced with Exmoor pony sales. Bampton Fair still happens every October but no ponies are now sold. However, there is much to do and see and of course, there is The Ginger Peanut to visit for tea, coffee, lunch, dinner and an overnight stay!